Charlie Taylor is starting to find his feet following a tough introduction to life in the Premier League. The summer signing, who made the switch from Elland Road, was handed his first taste of the top flight in December’s win over Stoke City at Turf Moor after full back Stephen Ward had sustained a knee injury. After passing his initial test against Swiss international Xherdan Shaqiri, the former Leeds United defender has faced the likes of Anthony Knockaert, Christian Eriksen, Juan Mata twice, Sadio Mane, Raheem Sterling, Wilfried Zaha and Bernardo Silva. Ahead of tomorrow’s trip to the Liberty Stadium, where Taylor will likely go up against Swansea City’s Nathan Dyer, who had a spell on loan with the Clarets, he said: “It’s the best league in the world and it’s going to take some time to get used to, but I’m finding my feet now. 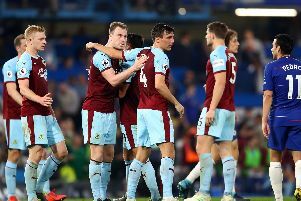 Sean Dyche’s side haven’t won in nine league outings but Taylor feels that the late equalisers against Newcastle United and Manchester City have embodied the character of the squad. “It would be nice to get that win, but nowhere is easy in the Premier League,” he said. “A win before a weekend off would be brilliant. “It speaks a lot about the whole team and the character shown, to never stop, and we’re getting the rewards. The Swans have picked up 11 points from six games since Carlos Carvalhal took over, beating both Liverpool and Arsenal on home soil along the way. The Portuguese boss has also guided the club to the fifth round of the FA Cup following the 8-1 thumping of Notts County midweek.